Inanna Foundation has the pleasure of inviting you to participate to the workshop Musiqi Suryayto (Assyrian/Syriac music) which has been funded by the EU Grundtvig Lifelong Learning Programme. This workshop aims to discuss the main problems and challenges of contemporary musiqi Suryayto and to provide a learning platform for people who are interested in the innovation of this music. Furthermore, it aims to enhance the level of the existing music and to professionalize it in order to be able to reach out to a broader audience. 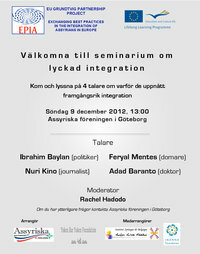 The first seminar activity of the EPIA project Promoting Active Citizenship: Upward mobility of Assyrians in Europe will be held in Gothenburg on 9 December 2012. Speakers: Ibrahim Baylan (politician), Nuri Kino (journalist), Feryal Mentes (judge) and Adad Baranto (doctor). Read more about this later. The second preparatory meeting of the Aramaic Online Language Project was held at St. Ephrem Monastery in the Netherlands (23-25 November 2012). Four Assyrian organizations, based in the Netherlands (Inanna Foundation), Germany (Stiftung Yoken-Bar-Yoken ), Sweden (Assyriska Föreningen i Göteborg) and Belgium (Institut Syriaque de Belgique) have begun an EU-project within the framework of the Grundtvig Lifelong Learning Programme. The first Preparatory meeting of the Multilateral Neo-Aramaic (Turoyo) Language Project was held in Bergen, Norway (20-24 June 2012). 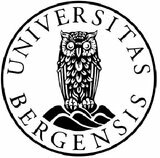 The hosting institution, University of Bergen (Department of Foreign Languages), together with the Inanna Foundation (NL) developed the working programme. Mgr Dr Polycarpus Augin Aydin (Netherlands), Prof Shabo Talay (Norway), Prof Otto Jastrow (Estonia), Malfono Jan Bet Sawoce (Sweden), Dr Naures Atto (Netherlands) and Soner Onder (Netherlands) participated in this meeting. The main aim was twofold: to develop a Neo-Aramaic project within the framework of the EU Multilateral Grundtvig Project in order to develop an online language course and to standardize the writing of the Neo-Aramaic language. Anyone interested can contact us for any information. The idea of an edited volume on Seyfo developed during the EU Grundtvig workshop 'An Intergenerational Approach to the Study of Genocide' which was organized by Inanna Foundation and took place in the Netherlands (June 10-16, 2011). For the first time the Seyfo and its consequences were discussed among scholars working in different disciplines. The first edited volume on Seyfo has attracted the attention of scholars both who attended to the workshop and who could not, but were interested in submitting articles. So far we have received more than 20 articles, focusing specifically on Seyfo from different perspectives. We are now in the editing process and aim to publish this work in 2013. Editors: Prof. Dr David Gaunt, Dr Naures Atto and Soner Onder. International Conference "Believers in the Nation". Naures Atto presented a paper, titled The Emergence of Umthonoyutho among Suryoye Elites during the Decline of the Ottoman Empire at the conference. Read more.